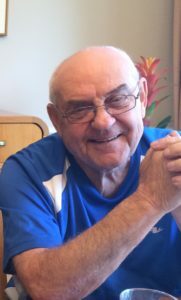 Glen Burrell passed away January 14, 2019 in Kamloops Hospice. Glen was predeceased by his caring wife Roseanna last winter. He is survived by his two daughters Brenda (Ken) Christian and Kathy (David) Elliott. Glen was tremendously proud of his five grandchildren, Nicholas (Melissa), Vanessa, Justine (Blair) Jonathan and Taryn. He always attended their major events and even befriended their friends. Recently Glen had a great grandson, Rowen Reid Smith who he called Gizmo. Glen is also survived by his older sister Barb Brooks in Ontario. Glen was born is Ridgetown, Ontario on Christmas Day 1934. He was honest, unpretentious and hard working. He worked for Manitoba Telephone for many years before moving to Kamloops in 1972. He drove cat on the chip pile at Weyerhaeuser (Domtar) and then moved to security in the guard shack. In retirement Glen became an ambassador at the Tournament Capital Centre (TCC). The TCC was Glen’s house. He became friends with the staff, patrons and particularly became the Number One Fan of the TRU Wolfpack. He was “Gramps” to many student athletes over the past decade. Glen had an incredible sense of old school blue collar humour. His one liners seamed endless and his timing was always on point. Although many will remember Glen for his humour, one of his best traits was to instantaneously connect with people of all generations from kids to seniors. Everyone that knew him cherished the memories of chatting and laughing with him. Pay it forward. Play Hard. Laugh every day. Glen often got names wrong or mixed up. It was not intentional, it was just a reflection of how many people he knew. He lived for the swag he collected and in the end was the only one in hospice with a Miami Heat Flat Brim ball cap. In his final days a new nurse came into his room to provide care and within minutes Glen had her laughing to which she said “Wow, you are a special one”. The family is so appreciative of the many who have reached out since Glen became ill. Neighbors, athletes, custodians, coaches and old friends; your kindness will never be forgotten. The hospice staff and Dr. Tracey Smillie made Glen’s final journey peaceful. A celebration of life for Glen and Roseanna Burrell will be held February 3rd at the First Valley Lounge at the Sandman Centre arena at 1:00 pm. In lieu of flowers please consider a donation to the TRU Foundation in support of athletics or the Marjorie Willoughby Snowden Hospice Home. We cherish many special memories with Glen and Roseanne for over more than 30 years. The love they gave will never be forgotten. Although we cannot be there at the rememberance you will be in our heart and mind. Brenda, Kathy & families, please accept our sincere condolences on Glen’s passing. He will be remembered by us as a spirit lifting brother in law and a fun to be with uncle, one who always made you feel welcome. I was very sorry to hear about the passing of your Dad. He and your mom were frequent customers at Canadian Tire where i work . They always found me when i was working and gave me the biggest of smiles. i will truly miss them both.